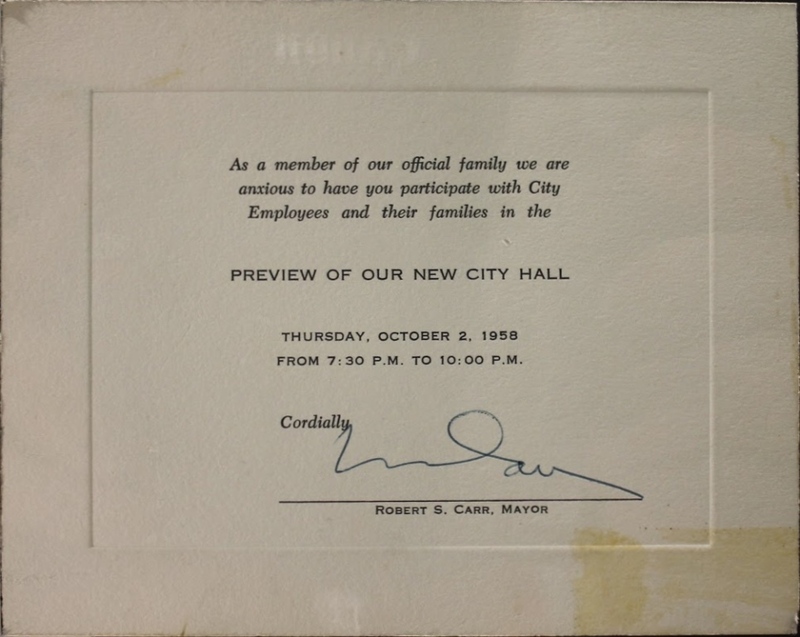 An invitation from Mayor Bob Carr (1899-1967) sent for an early preview of the new Orlando City Hall, which was to be dedicated on October 3, 1958. Mayor Carr served from 1957 through January 29, 1967, when he died in office. It was during his tenure that Walt Disney (1901-1966) announced plans to build the Walt Disney World Resort in the Greater Orlando area. The new city hall was designed by Richard Boon Rogers and stood eight stories tall. The building was technologically up-to-date for its time with air conditioning and fallout shelters. Additionally, it was the first city hall Orlando had which was designed for that purpose. It remained in use until its destruction in 1991, which was filmed for use in Lethal Weapon 3. The new city hall was much more spacious than the previous building used. Grace Chewning, who worked in the clerk's office, described the new city hall as "so open there was such a feeling of freedom." Original invitation, 1958: Orlando Remembered Exhibit, Orlando City Hall, Orlando, Florida. Digital reproduction of original invitation, 1958. Owens, Sherri M. "Rogers' Structures Seen All Over Orange." The Orlando Sentinel, February 16, 1998. Accessed February 3, 2016. http://articles.orlandosentinel.com/1998-02-16/news/9802160102_1_rogers-orlando-university-of-florida. Fishman, Charles. "Orlando City Hall: A Building Gives Up The Ghost, Without Giving Up Its Ghosts." The Orlando Sentinel, July 14, 1991. Accessed February 3, 2016. http://articles.orlandosentinel.com/1991-07-14/news/9107121105_1_new-city-hall-stanton-orlando. "Orlando City Hall, 1958." RICHES of Central Florida, accessed February 3, 2016. https://richesmi.cah.ucf.edu/omeka2/items/show/6513. 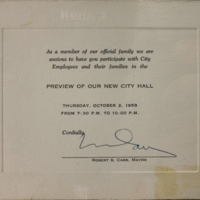 FROM 7:30 P.M. TO 10:00 P.M.
“Invitation from Mayor Bob Carr for City Hall Dedication.” RICHES of Central Florida accessed April 24, 2019, https://richesmi.cah.ucf.edu/omeka/items/show/6524.